What has gone wrong at Manchester United? 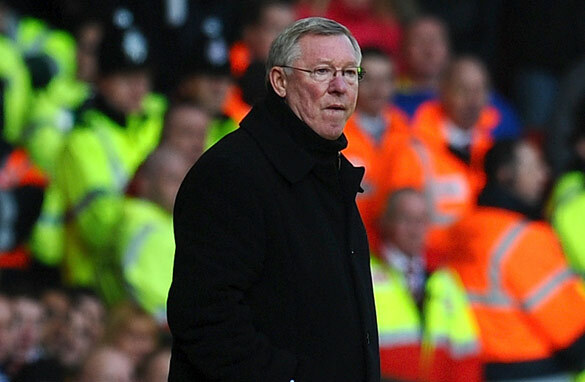 Alex Ferguson has seen his previously unbeaten Manchester United team slip to three defeats in their last five games. What a difference a month makes. When Manchester United lined up on February 5 to take on Wolves, they had not lost a single Premier League game all season and were marching towards another league title. Fast forward four weeks, and they have now tasted defeat no less than three times in five games, and their lead at the top of the table has shrunk significantly. So what has gone wrong at United, and will they be able to right the ship in time to sail to a 19th league title? Let’s start by tackling the first question. In my mind, there are a couple of reasons why United have struggled to maintain their winning ways. The absence of Rio Ferdinand is the most important one. It is no coincidence that their slump began when the defensive stalwart picked up his latest injury. He is indispensable in the line-up, not only for his skills but mostly for his leadership. When Ferdinand is on the sidelines, I often notice the absence of a voice who directs Alex Ferguson’s troops on the field. The defeat at Liverpool would not have happened if Ferdinand and Nemanja Vidic would have played. As impressive as Luis Suarez’s work inside the box was for Liverpool’s first goal, the Uruguayan forward would never have been able to pull off that move with United’s top defensive unit around. Ferdinand or Vidic would have tackled him. There is no doubt about it. The same can be said about Liverpool’s other two goals. Predatory strikes from the valiant Dirk Kuyt, but he would surely not have enjoyed the space given to him by Chris Smalling and Wes Brown had the big boys been around. So all Ferguson can do is hope Ferdinand comes back soon. The 32-year-old central defender should return on March 12 for United’s FA Cup clash with Arsenal at Old Trafford. Has Ferdinand’s absence been the only reason why United have struggled? No. I am also going to point some fingers at United’s average midfield. If you look around most of the top teams in Europe, they all have at least one defensive midfielder who protects the back four. They have someone who can tackle and who drops back when the full backs attack, adding balance in the middle of the park. I am talking about players like Sergio Busquets, Sami Khedira, Esteban Cambiasso or even Alex Song. Manchester United do not have anyone like that. Their only player with those characteristics, Owen Hargreaves, has been injured for the past three years. If there is one thing Ferguson needs to do this summer, it is buy a player who fits this mould. Michael Carrick, Darren Fletcher, or even Anderson are all average players who have reached their potential and are not good enough to play for one of the world’s top teams. Good passers? Yes. Decent tacklers? Maybe. But none of them are great at anything in particular, and they are not going to improve in the future. It is time for Ferguson to shuffle the pack. While United have struggled recently, and in my opinion need to renew their squad, they should still be good enough to win the title this season. This is mostly because the quality of the competition is not fantastic. In previous seasons, maybe they would have struggled to hold on, but this year I do not see Arsenal or Chelsea being strong or consistent enough to overtake the current leaders. They may come close, and Arsenal can draw level with United on points if they win their game in hand, but I just don’t think the Gunners have the necessary weapons to shoot down the leaders. Have some decency and give credit to a better team. Your lack of football knowledge is obvious. Stick to the 'football' you know not the one that actually use the foot. We can add Gibson, Obertan, Bebe, O'Shea.Giggs and Scholes are finished. Berbatov is not good enough. Four goals against poor opposition and than two months nothing. We played well vs Chelsea because he wasn't in the team. To be precise only world class players in United team are Ferdinand, Vidic, Evra and Rooney. I've actually watched you on World Sport for quite few years now, although I haven't watched CNN a great deal lately. I imagine you're still on WS..so firstly..let me say hello from London. Your article would have been more accurate and balanced if it had pointed out how completely outplayed they were on the day. It was less about what Man U did wrong, but what LFC did right. Clearly MU could have protected their back four with the likes of Fletcher, but they chose not to, and the better team won, convincingly. I say this as an objective LFC supporter. "The defeat at Liverpool would not have happened if Ferdinand and Nemanja Vidic would have played." They played in the 1-4 mauling of United by Liverpool in 2009. Two years later what makes you think that things would have changed so rapidly. The reality is: Liverpool are a better side than United. "Ferdinand or Vidic would have tackled him. " They might have ended up giving away a penalty. Liverpool won fair and square live with it. awesome Pedro...i knew you wouldn't be able to resist the analysis. Amazing how one player can change the dynamics of the game. Rio is that important. On point! I had a budgy but it died. I like pie. Absolutely spot on. I' wish Sir Alex would read this. HIlariously biased "article" I cant believe CNN pays people for this nonsense. Thanks Pedro pinto for telling things exactly the way they are. As much as i love Arsenal i couldn't agree with you more.They will only be champions if luck is on their side,but otherwise i do not see them passing united.Arsenal defence is not very steady and the attack is not super,van persie is superb but chamack and bentner are not top strikers. I don't know what it will take Wenger to accept that he can't go on like this.He needs strong and experienced players as well as young inteligent talent,not only the latter. Ferdinand's absence had nothing to do with Liverpool's victory. He may be a leader and good reader of the game, but he's slow compared to how he used to be, and anyway, he's only played in 15 of the 29 games United have played in the league this season, and until recently they'd done fine without him. Vidic was a bigger miss. Liverpool was the first league game he's been out, and you saw what happened. I don't believe Kuyt would have scored any of his goals if Vidic was on the pitch. He'd have dealt with Suarez's run before he crossed the ball or at least been on hand in the six yard box to put in a challenge when the ball was slipped through. He'd have headed away Nani's error, and he'd have been quickest to the rebound off the free-kick. After all, Kuyt's not exactly greased lightning is he. Midfield-wise, you may have a point. Fergie does need a better holding midfielder than Carrick, Fletcher or Anderson because their tendencies are more attacking than defensive. Though I disagree that they're below United standards, they just don't have the defensive skills and discipline required. United should still have enough class and experience to win the title, but I'd argue with your claim that it's because the league is of a low standard this season. It's got depth, which your beloved Spanish league most definetly has not. There's no outstandlngly great teams and no rubbish teams either. You only have to look at the relegation battle to see that. That means the English champions will have had to work a lot harder to with the Prem this season, and, as a fan of football, I'd much prefer that to the two team procession you get in La Liga. Didn't know you're a ManU fan! You have too much faith in a team that's getting embarrassed every other week. You fail to say United have been less than impressive so far in the season. They've limped so far of the season. Man U. is an old team isz about time Ferguson mentain players who can stand the test of time. .It is nonsense to think that had Ferdinand been there it wouldn't have happened. Just incredible thing to say. Certainly, Ferdinand is important there. But just preposterous to say it wouldn't have happened. Maybe Pinto was dissapointed about Suarez dancing through the defense ... or back from the future ? Pedro Pinto: you must have watched a different game than I did. Perhaps a better defender could have stopped Suarez, but how about the second goal? That one was clearly on Nani (one of Liverpools own couldn't have headed that nicer!) and the third goal was completely on the goalie, a halfway decent goalkeeper (of which there seem to be none in all of England) would have either kept the ball or deflected it *outside* the goal. half baked, superficial ideas. disappointing cnn article. could get better insight from local pub. Spot on Pedro, but then every season has its highs and lows. Hopefully United will pick up before Rio even returns. Mr. Pinto, I usually disagree with just about every article you write but I have to say that you wrote this one well. You are completely right on the fact that if Rio and Vidic played against Liverpool things would have been much differen't for their strikers, but would it have changed the outcome of the game, I don't think so. Liverpool is a HOT team, everything they are doing right now is perfect football with a young great up and coming team that will be at the top of Premier League standings for years to come. Man U is on a slow decline with a bunch of old talent that, don't get me wrong are very good, but will they be able to keep up in the next few years? My guess is no. Not with the likes of young strong stars in Liverpool and Arsenal. Also I believe that yes Man U will probably hang on to win the title this year but that is NO guarantee, they are in rapid decline right now. Arsenal is chomping at the bit to take over that top spot and I wouldn't be surprised if in the end the come out a couple points ahead. LOL that the majority of people commenting on this article are Liverpool fans. It's also LOL that Liverpool fans are trashing Man Utd after one game and saying that they're better. FYI, Man Utd have beaten Liverpool on 2 other occasions this season alone. I guess beating Man Utd only once this season is the only thing Liverpool fans can celebrate about, especially after all the circus that Liverpool have, and deservedly, gone thru the last couple of seasons during the Benitez & Hodgson era. Come one people, if Liverpool played well and beat Man Utd, why on Earth is all credit given to the fact that Ferdinand and Nemanja didn't play. With or without Ferdinand and Nemanja, Liverpool can beat Man Utd now or in the future. A united fan to boot! Surely Wenger has better choice, Ferguson looks pretty from his seat. Note this: Arsenal will come full ammo. Wilshere may be out injured but Fabregas returns! We can disregard Chelsea at the moment, they're struggling internally because Roman wants his 50mil quid up front but he cant finish w/o a pass from Gerrard. "Liverpool are a better side than United" I totally agree with that point BUT, only when Liverpool meets United. The league table speaks for itself. United have not been playing good AT ALL, not even a single game (apart from that game where Berba got 5). They managed to slug it out even when they didnt look like they had the will to win. Anyways, taking the Liverpool match context aside (Congrats to Liverpool), I agree with Pedro's point. Midfield is less than mediocre where everyone is just..bland. The reliance on Giggs and Scholes, when is this gonna end? Another point to note, although Smalling has been playing good but only when Vidic is around to 'guide' him. Put Wes Brown/O'Shea/Evans and you get a centre back thats more fragile than paper on water. Fergie, you need a few new 'proven' players to fill in the obviously big gaps in your team. I am a United fan btw. May I add. But I'll point a finger on SAF. Man Utd have been lacking character and strength all together. Experienced players like Scholes, Rio, and Giggs won't solve the problem at hand. SAF needs to step up and make men of his boys. There was a lot to learn about SAF from that 2-0 CL final defeat against Barca. If you ask me, he's getting too old for the job. And for crying out loud, get a few good mid-fielders! @Robbie: Add Nani to that list. If Hargreaves is healthy, Man U have a perfect team. man U need mid-fielders. nani need to go. and back to the main question.Our main problem is Michael Carrick.He's a waste of space but Alex Ferguson is failing to see it that way. the best defence is an offence. MU has good a good offense but if my memory serves me correctly has mostly invested in attackers at the expense of defenders based on the adage that if opposition scores once then we score twice. Ferdinand has been a tower of strength and marshalled his troops with authority but he has with age, he is now in his 30s and not getting younger, become very much injury prone and seems to be more out than in the game. Therefore, a replacement for him and maybe one or two others in the defensive line-up must be very much contemplated. Based on recent performances doubtful we'll see much, if any, silverware going MU way this season. Three defeats in five games (for the first time in six years) and everybody starts wondering 'what has happened to Man Utd'. Given that this is probably the 'worst' United side in recent years, what does that say for the rest of the division who are still looking up at United who are still on top!! after we sold ronaldo,we dont spend money,and chelsea beat us,by one point. This year we win a tittle. hey gus the biggest club of the world call VASCO DA GAMA and is a brazilian team. Rio de Janeiro, Brazil!!!! We won M. United by 3 x 1 on the FIFA championship 2000. Were a show of the football!!! Pedro, i agree with you. However, would add that Evra is getting old. If you want to beat Man U, attack through his position. our central is quite simply awful,Gibson,Carrick,Anderson,Bebe,Obertan a disgrace to the jersey and there is too many old players as well,Giggs and Scholes mid 30's and gives them new contracts,shocking,Ferdinand and Evra at most have another 2 years at the top. Unless Ferguson invests big time in the summer United won't finish in the Top 4 next season and that is a fact. Sir Alex,would not able to say that apsent of Rio is man utd problem no.the matter is what are schol Gigg Nevil Brown Park and Hargrves withing for. Man utd is a big team in world today please aviod defit. Are u not seing Nani the type of self-fish playing the boy doing look valencia is clean heart man doing very good team job for the club.and Sanchez is good enough for utd and look other young star in Santos Henrique is good mid player, The world say mancherster it mean man make a name. Hi from africa, first i want to say that Man utd now is been let down by the midfield that doesnt give the back four protection it surpose to give. Carrick the first time he started playing for the team he was good but after defeat from Bayern(German club) in champion league and a stream of play at the center back, he his drop he form from 90 to 30 percent and i think he should be off loaded during the summer,Bebe and Obertan to there mischiefs the scouts and manager are at fault of bring player whom to my view are not ready for the league and were waste of money.Anderson and Gibson are not defencive players but can creat attacking possibility with the Brazilian having a slight advantage over the Irish star,Fletcher a player who doesnt have anything to show off, hes just a muscle guy who can pop out of nowhere and do something no one can imagine he could do.Giggs and Scholes are way past there time not each game will give as what we fans want in the game.Owen H should be given a chance to show as what he has left if he cant off load him as well.So Feguson invest in midfield and defencive midfield oh defence also. Man U's mid field has gotten over confident and less versatile because of the unbeaten run. They needed some losses to get back to their senses so the losses to Liverpool, Chelsea and Wolves have woken them up so game on for all those who think there is a problem just keep watching you will be shocked.